Diffusion of Electromagnetic Fields in Magnetically Nonlinear Conducting Media (Linear Polarization). Diffusion of Electromagnetic Fields in Magnetically Nonlinear Conducting Media (Vector Polarization). Nonlinear Diffusion ofWeak Magnetic Fields. Nonlinear Diffusion in Superconductors. Nonlinear Impedance Boundary Conditions and Their Application to the Solution of Eddy Current Problems. Subject Index. 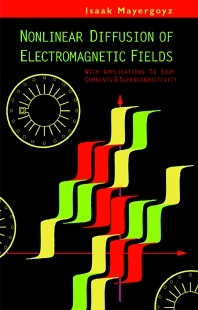 Nonlinear Diffusion of Electromagnetic Fields covers applications of the phenomena of non-linear diffusion of electromagnetic fields, such as magnetic recording, electromagnetic shielding and non-destructive testing, development of CAD software, and the design of magnetic components in electrical machinery. The material presented has direct applications to the analysis of eddy currents in magnetically nonlinear and hysteretic conductors and to the study of magnetization processes in electrically nonlinear superconductors. This book will provide very valuable technical and scientific information to a broad audience of engineers and researchers who are involved in these diverse areas. Researchers and graduate students in the electrical engineering and magnetic community, and practitioners in related industries.